Finalist in Harvard’s Pluralism Project Photography Contest! most of you probably know me as a poet or a DJ. you may have seen me taking pictures at some poetry slams but probably don’t consider me a photographer. i didn’t really consider myself a photographer either really, until recently when i began shooting and editing more purposefully. young poets i work with are still the majority of my focus, but i’m expanding from writing and performance into photo and video documentation and editing. here is my photo that was selected as a finalist in Harvard University’s Pluralism Project’s 2013 Photography Contest. 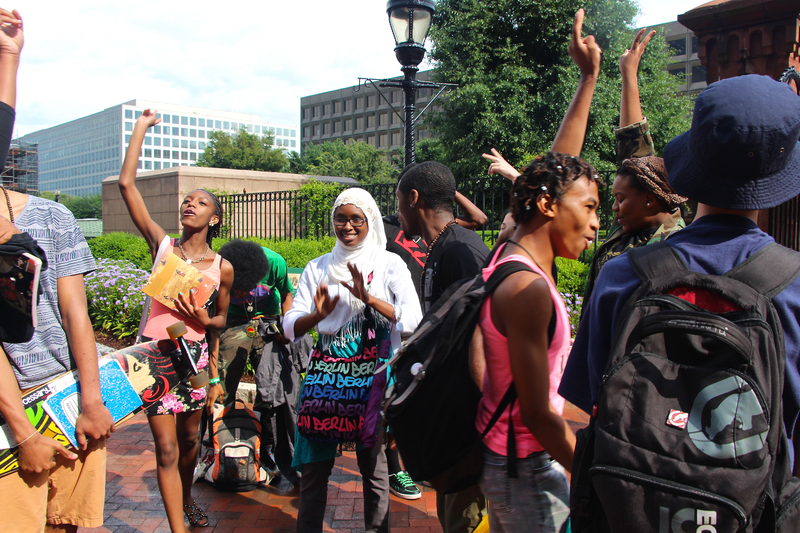 After a successful meeting at the Smithsonian African Art Museum on the National Mall, students of the DC Youth Slam Team celebrate outside with an impromptu dance party and freestyle cypher. The DC Youth Slam Team brings together teenage poets across lines of race, religion, socioeconomic status, and sexuality to use spoken word poetry to raise and challenge issues of social justice and build peace (July 2013). check out the other finalists here. In the fall of 2013, the Pluralism Project announced its third annual Photography Contest to document the vibrancy of religious diversity in the United States. The DC Youth Slam Team (pictured) has students that identify as Agnostic, Atheist, Jewish, Muslim, 5 Percenter, Catholic, Baptist, and just generally Christian. It’s a very diverse group in many ways, as poetry brings people together across all identities.